If you plan on spending any significant time around a rat, the sound of chattering teeth will undoubtedly become a familiar one to you. Teeth grinding in these rodents doesn't have one single meaning, and can signify anything from nervous discomfort to tranquility -- a set of two decidedly different emotions. This behavior is often referred to as "bruxing." If you hear you pet rat chattering his teeth in an extremely noisy manner, it could mean that something is causing him to feel frustrated and nervous. He could be uneasy about something -- perhaps the sounds of someone in the next room hammering a nail into the wall. As rodents, rats' teeth grow perpetually as long as they're alive. Rats grind their teeth as a means of keeping their chompers at reasonable and healthy lengths. If they didn't do this, their teeth would keep growing and growing endlessly -- yikes. Excessively long teeth in rats can bring upon serious problems, notably difficulties in chewing food. Rats frequently chatter their teeth to express joy, not too different from a tail-wagging dog or purring kitty. If your rat feels comfortable and cozy, he might react by softly chattering his teeth. If you notice your rat chattering his teeth when you're around, it could even be his way of expressing his love and admiration for you. If he's feeling really giddy, he might take it upon himself to lick you too, a lot like dogs do. Rats can be highly companionable creatures once they're fully comfortable being around the people in their lives. Eye boggling frequently accompanies teeth chattering in rats. When rats do this, their eyes typically exit and then reenter their eye sockets, over and over again in an extremely swift manner. Although the sight of it is usually strange, it generally signifies a joyous rat who is on cloud nine. Eye popping is another common name for this behavior. Teeth chattering can denote numerous emotions in rats, and as a result can sometimes be confusing. Clues can sometimes help point you in the right direction regarding your rat's current feelings, however. 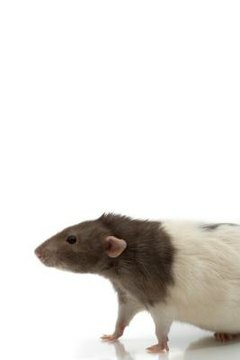 If you hear your rat grinding his teeth and observe that the hairs on his body are standing straight up, it generally indicates that he's feeling pretty agitated at the moment -- no happy camper. What Does It Mean When a Guinea Pig Runs Around Really Fast?